With the dog days of Florida’s sizzling summer and the family travel season in full swing, Florida injury lawyers are urging visitors to our many amusement and theme parks to exercise safety to avoid potential personal injury. 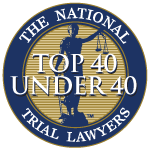 “Whether you are visiting the world-famous resort destinations in Orlando or the local water park or community pool just around the corner, ensuring a safe summer for you and your family means following a few simple rules,” said Attorney PJ Scheiner of Associates and Bruce L. Scheiner, Personal Injury Lawyers. More visitors suffer from sunburn, rashes, heat exhaustion and heatstroke than all other injuries put together. Water is your best friend in helping prevent heat-related illnesses in theme parks. Chugging water in the park won’t help as much as getting well hydrated two to three days before your trip. Put on a waterproof sunscreen before you enter the park, and remember to reapply it throughout the day. A soaking sweat, or a couple of water rides, can wash many sunscreens off. A hat or sun visor can help, too. Simple collisions are another source of many theme park injuries. Be aware of where you are, and who is around you. Don’t stumble into someone else, or worse, trip over a child in a stroller. And if you’re the one pushing a stroller, be courteous – watch where you are walking so that you don’t crash into others’ legs and feet. Never enter a restricted area in a theme or water park. Don’t climb or hop fences or walk through employee-only gates. If you drop a hat or other item that falls into a restricted area, such as under a roller coaster, ask a park employee for help. Read an attraction’s boarding restrictions before you get in line. If you are pregnant, have pain or injuries in your back or neck, or have a heart condition, you will not be able to go on some rides. If you are shorter than five feet, or taller than six, you’ll also encounter rides where you will either not be permitted, or won’t be comfortable. Some parks make special seats available on select rides for larger visitors – just ask. People who are overweight often have high blood pressure, which could put them at higher risk on some high-speed, twisty rides. If you have high blood pressure, or think you might, skip the big roller coasters and simulator rides until you’ve checked with a doctor. You can always stop by a park’s Guest Relations office, usually located near the front gate, if you still have questions about which rides will be appropriate and comfortable for you and your group. Of course, you need to know if you have a health condition that should keep you off certain rides. If you haven’t had a check-up within the past 12 months, make that a top priority before your next theme park visit. The same holds for your kids, too. Too many incidents that occur in theme parks are the result of undiagnosed medical conditions. Know your health condition, and that of your children, before you visit. Don’t “cheat” or ignore the rules to get on a ride where you don’t belong. You might think a ride looks tame enough for you. But sometimes there are potential problems on a ride that most visitors can’t see — a hidden drop or turn, a sudden stop, or a portable ladder that riders will have to descend if the ride shuts down. Don’t think that you know more about a ride than the park does. If they tell you not to ride, don’t. And don’t even think about cutting in line. Nothing provokes more fights and nasty exchanges in theme parks than impatient folks who won’t wait their turn. It’s not worth getting thrown out of the park just to save a couple minutes in line. Don’t take it upon yourself to enforce the rules, though. If you see line jumping, please report it to the nearest employee at the ride or, if possible, a security officer. On any theme park ride, keep your rear on the seat, your hands on the grab bar and your feet and knees inside the car. And don’t crowd others who might be exiting when you are getting on. If there is no grab bar, keep your hands on your lap. If you are riding a “floorless” coaster, relax your legs and let them dangle underneath you. Don’t kick them out to the side or front. If you are on a ride with a lap bar, seat belt or safety harness, make sure that it is in place, snug and locked. If the ride starts to move and your restraint is not in place, immediately call for help. Do not get on or off a ride until you’ve been given the okay by an attendant to do so. Make sure that your vehicle has stopped next to the unload platform before you get off. Often, vehicles stop short of the unload platform to wait for groups up ahead to exit. 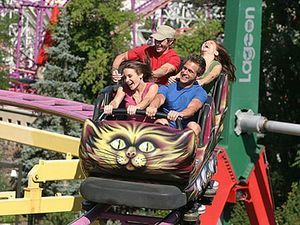 Some rides, especially roller coasters and simulator rides, can whip your head around, leaving you at risk for headaches as well as more serious head or neck injuries. On those types of rides, sit in the middle of the chair and don’t slouch or lean to one side. Relax, but do not go limp. You want to keep your balance in the seat. When the seat pitches you to the left, relax your torso and bend to the right to keep your head upright and centered. Again, if you are prone to headaches, have any neck or back problems, or have been diagnosed with an aneurysm, do not get on any roller coaster or simulator ride. If you are visiting with a child, take a moment to explain the ride to them, and tell them how they should behave. They are depending upon you to keep them safe. Set a good example for them by following the rules above, and make sure that they know you expect them to follow those rules, too. Kids get tired, and tired kids make parents even more tired. When you are tired, you are more likely to get hurt, both physically and emotionally. Consider a mid-day break, perhaps a swim back at the hotel, to avoid the peak heat and crowds. If you see something wrong — a broken restraint, a person jumping the line, or anything else that could jeopardize the safety of a park guest — alert a park employee immediately. They are there to help keep you safe. According to the U.S. Consumer Product Safety Commission, (CPSC), there have been more than 15,000 amusement ride-related injuries in the U.S. per year since 2001. The CPSC tracks statistics for all amusement ride accidents, not just at the wildly popular Florida theme parks. These accidents may also occur at traveling carnivals and fairs, on portable inflatable attractions, and on fixed-site amusements such as roller coasters. 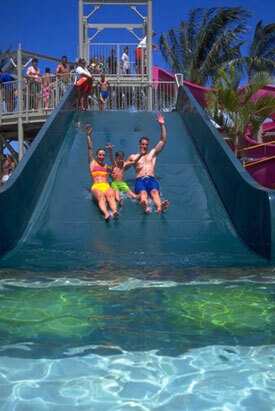 Oftentimes, the negligent operation of the ride or the facility itself can result in a serious injury or even death. The International Association of Amusement Parks and Attractions, (IAAPA), a trade association for permanent amusement park facilities, reports that 300 million people visit amusement parks each year. Accidents can, and do occur, and Florida personal injury lawyers continue to remind people that safety is the number one priority. Our family of nearly 100 support staff and attorneys at Associates & Bruce L. Scheiner Personal Injury Lawyers encourage people to safely enjoy the cool splash of a water park slide or the exhilaration of a monstrous thrill ride this summer. If you or a family member has become the victim of an amusement or theme park accident, let us help you fight for your legal rights, and the fair compensation you may deserve after a catastrophic injury has turned your world upside down.